• Leo Vegas Casino Review - An Old Contestant, But A Worthy One? New punters are treated to a royal welcome bonus of up to £400 on their first four deposits. Register with Leo Vegas and make a small deposit, and the casino will reward you with £100 welcome bonus. On your second deposit, Leo Vegas will top your account with a 100% match bonus of up to £100. The third deposit gets you an even better bonus of 100% up to £100. The fourth deposit completes the massive welcome package with a 100% match bonus of up to £100. There are other interesting promotions at Leo Vegas meant to keep loyal players feel like royalty. Although these perks will change with seasons, they always involve free spins, cashbacks, and deposit matches, and will always come on daily, weekly, and monthly basis. The Leo Vegas VIP club adds extra excitement onto your wagering and entertainment escapade at the casino. Here, you’ll experience some of the best VIP treatments around, with top-of-the-line customer service, royal treats, and fun-filled surprises. Watch your curve rise by a quick glance at your VIP BAR, which automatically rises whenever you make real money bet on your Leo Vegas account. Significant terms: 18+. New UK players only. 20 Free Spins on sign up. Deposit Bonus: 100% up to £100 Bonus + 20 Bonus Spins, on each of your first 4 deposits. £10 min deposit (Skrill, Neteller excluded). £5 min. wager to activate Bonus Spins. All spins are valid on Book of Dead and expire after 7 days. 35x wagering on eligible games (£5 max stake) before Bonus, Free Spin or Bonus Spin winnings can be withdrawn. Eligibility restrictions apply. At the time of writing, you get 20 Bonus Spins with each of the four first deposits. Leo Vegas has a tradition of offering free spins in unison to the match bonus. Some few weeks ago, it was giving new players 300 free spins on various slots including Starburst, Jack and the Beanstalk, Mega Fortune Dreams, and Multiplier Mayhem to enjoy together with the cash bonus. These free spins were split uniformly across the four deposit cash bonuses. On the bright side though, the casino offers a surfeit of free spins on its normal promotional offers, which, as mentioned earlier, come on regular basis. Additionally, players can use the latest promotion offered by Leo Vegas to get 20 Bonus Spins without any deposit requirements! Significant terms: 18+ New Customers only. Registration required. Free Spins on Book of Dead are subject to change and expire 7 days from activation. 35x wagering requirement before any winnings can be withdrawn. For eligibility see full T&C’s. Ask any avid punter out there, and they’ll tell you they detest the annoyances associated with bonus codes. Any player wants to get into a casino, register, and have their welcome bonus deposited immediately into their account. Leo Vegas understands just how important this is to players, and as such, avoids the use of promo codes at all costs. At this casino, you only need to register, get your bonus, and start playing! No bonus codes, no claptrap! Leo Vegas Casino boasts one of the vastest gaming portfolios you’ll ever come across! Those who love slots are treated to a colossal 1000+ plus games including 3-reel, 5-reel, 3D, and progressive jackpots. This is quite extraordinary for a casino that is well-known for its mobile efficiency. Leo Vegas religiously delivers games with utmost speed in gameplay, slick graphics and animation as well as realistic sound play. Some of the hottest games on the shelves include Gonzo’s Quest, Vikings Go Wild, Dragon Kingdom, Da Vinci, Hot Safari, Book of Dead, Ted, Starburst, and more. Players who love classic, 3-reel slots would relish games such as Super Nudge 6000, Lucky 7, and Mega Joker. Those looking for huge winnings can take part in one of the progressive jackpots including Slots O’ Gold, Top Cat, Count Duckla, Lion Festival, Mega Pits: Mega X, Super Spinner, Ultimate Super Reels, and more. When it comes to RTP% (Return to Player Percentage), most games at Leo Vegas score over 90%, which means more winning possibilities for players. Leo Vegas has a sensational list of high-tech live dealer games available at the click of a button. This includes various versions of Roulette and Blackjack such as American Live Roulette, Live Roulette Room International, Celebrity Blackjack Party, Immersive Roulette, Silent Live Blackjack, Speed Live Roulette, and much more! Expect up-to-the-minute streaming as well as highly professional dealers. Leo Vegas mobile gaming is certainly hard to match. The operator is widely recognized as the “King of Mobile Casino” owing to its collection of awards from this façade of gaming. Leo Vegas was crowned the prestigious ‘Mobile Operator of the Year’ in 2016 at EGR Nordic Awards; Mobile Casino Product of the Year’ in 2017; Best Native App in 2017 at EGR Marketing and Innovation Awards; and Best Innovation in Mobile and Tablet’ at EGR Innovation Awards 2016. Its extensive list of mobile games is unparallel while transitioning from desktop to mobile is absolutely amazing. You’ll need no app to play, just log on using your mobile browser and access the casino via iOS, macOS, Android, or Windows. The casino employs a 2048-bit SSL certificate from DigiCert to protect players information from any form of hacking activity. This is certified by the fact that Leo Vegas is dual licensed and regulated by Malta Gambling Agency (MGA) and UK Gambling Commission (UKGC). These two statutory gambling authorities are reputable for safeguarding player’s interest, promoting security and fairness, and encouraging responsible gambling. Leo Vegas score an amazing A+ when it comes to handling matters relating to its customers. A professional support team is available 24/7 via live chat, phone (toll-free UK, 0808 189 0184 and international hotline, 00 356 277 811 87), email (support@leovegas.com), and a resourceful FAQ. Unfortunately, if you’re a resident of the following country, you’re prohibited from participation: USA, Afghanistan, Kuwait, EU, Iraq, Iran, France, Belgium, Ethiopia, Cyprus, Spain, Yemen, Saint Lucia, Niger, Egypt, Croatia, Haiti, Jamaica, Albania, Belarus, Guatemala, Fiji, Serbia, Equatorial Guinea, and more. Please check accessibility. You can tell the Casino Gorilla enormously enjoyed his time with the king of the Vegas Jungle. As a matter of fact, he can’t let go of his smartphone as he jumps from one slot to the other. Do you love playing on the go? 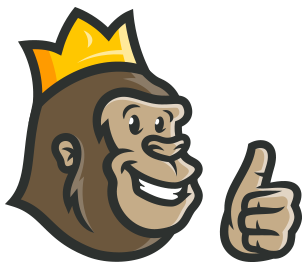 Join the Casino Gorilla in raving about Leo Vegas. The red carpet is rolled for you to pass beyond the royal front doors of this online casino. What’s at the end of this lavish red carpet? An assortment of first-rate casino features to appease novice and seasoned punters alike. 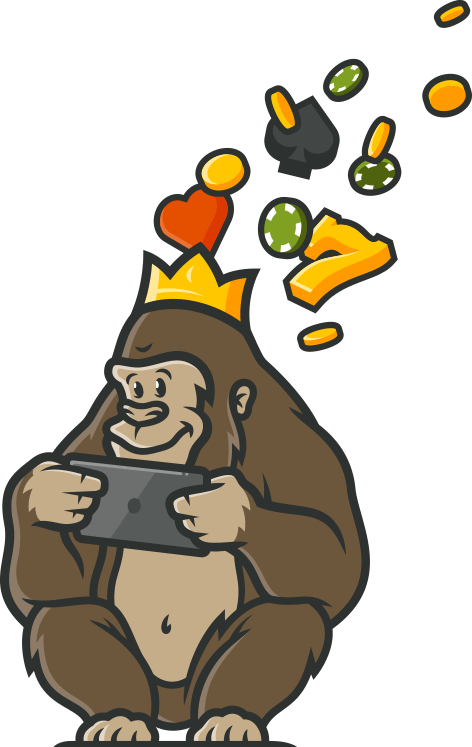 If you’re seeking some sweet nostalgia, as did our Gorilla, or needing some fresh content, Leo Vegas will surely keep you entertained! Oh my god guys, this is one of the best casinos I have found that provide a seamless mobile gaming experience and with many good titles to choose from. For live gamers like me, they also have one of the best collections of games from all different types of genres like Blackjack, poker and roulette. I also had my peace of mind while playing at the casino when I found out that they hold licenses from the United Kingdom Gambling Commission. Got started with a no deposit bonus, but the wagering requirements were high. Never made a deposit, but I do play the free games on a regular basis. This is probably a good site, but I just didn’t create a real money account yet.